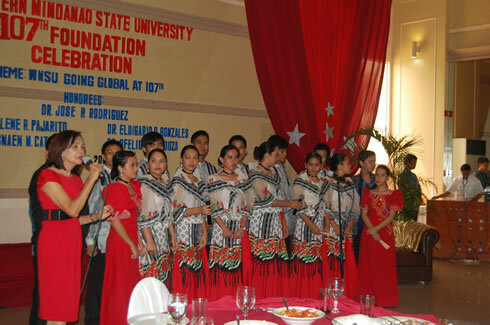 Western Mindanao State University celebrated its 107th Foundation Day on July 25. With the theme: WMSU Going Global on 107th, the university commenced with its line-up of activities. A mass was scheduled at 7:30 A.M. at the Dr. Juanito Bruno Gymnasium of the university. At 9: 30 A.M. a motorcade around the city proper followed through. The Conferment of the Degree of Doctor of Humanities Honoris Causa to Sr. Jose R. Rodriguez was the highlight of the flurry of activities. Sr. Jose R. Rodriguez is the current Director of Instituto Cervantes in Manila which is tasked to promote and teach the Spanish language and culture worldwide. Following the conferment ceremony, Atty. Darlene R. Pajarito, Zamboanga prosecutor and WMSU alumnae was commended by the university during the midday function at Grand Astoria Hotel of this city. Atty. Pajarito was remarkable for successfully prosecuting the first human trafficking case in the Philippines and trying the first labor trafficking prosecution resulting in a conviction. Atty. Pajarito’s exemplary performance was recognized by the United States of America and was bestowed with the 2011 United States Global Trafficking in Person’s Hero Award. Former WMSU Prexy, Dr. Eldigario D. Gonzales; former Alumni Regent, Dr. Ofelio R. Mendoza; and former Faculty Regent, Prof. Esnaen M. Catong were also awarded with Plaque of Recognition for their leadership and invaluable contributions to the university’s pursuit of academic excellence.